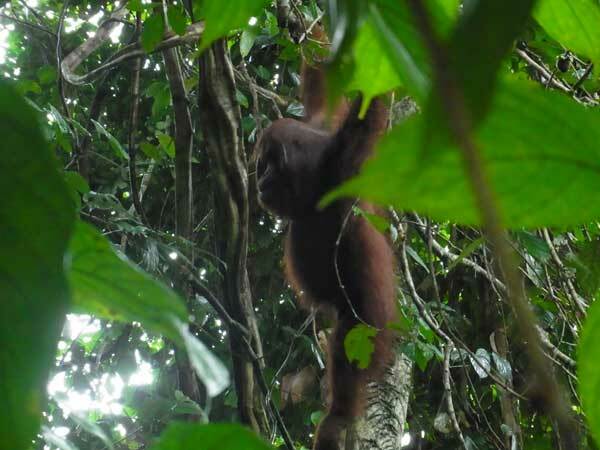 We visited two sites in Sabah, Malaysia, where wild/captive orangutans are living. From December 11 to 14, we stayed in Borneo Rainforest Lodge (BRL) to observe wild orangutans in Danum Valley Conservation Area. Through trekking in the rainforest, we were able to record behaviours of orangutans and observe many kinds of wildlife. We mainly observed a male orangutan with developed cheek flanges, Abu. In addition, we got the information on the rainforest ecosystem from researchers and guides in BRL. On December 15, we moved to Sepilok Orangutan Rehabilitation Center (SORC) to observe captive orangutans. The staff in SORC feeds orangutans twice a day and we can observe them from the platform. Also, we saw two kinds of macaques (pig-tailed macaques and long-tailed macaques). I had interests in the relationship between orangutans and macaques. Additionally, we visited the rehabilitation facility and learned the conservation and rehabilitation of wildlife.